As regular readers will know, I often post quick and easy recipes on here. This is NOT one of those occasions. These are more of a whole weekend project, seriously. There’s nothing particularly difficult here, but there are a lot of stages and lots of work, but I enjoyed the process, and the results. 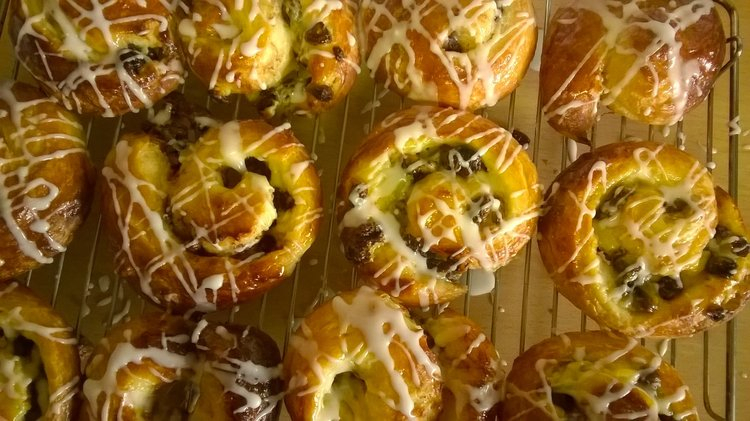 I used Paul Hollywood’s Danish Pastry Dough recipe with a few small changes. 1. Put the flour into a large bowl. Add the salt and sugar to one side of the bowl and the yeast to the other (otherwise the salt can kill the yeast). Add the eggs, water and milk. Paul’s recipe says to mix this in a mixer with a dough hook on slow speed for 2 mins and then medium speed for 6 mins. I don’t have a mixer with a dough hook, so I did as much as I could with a fork, and then worked it with my hand, which probably isn’t ideal because it should all be kept cold, but it seemed to work out ok! 2. Tip the dough out onto a lightly floured surface and shape into a ball. I had to add a bit of extra flour here before shaping it into a ball because the dough was just too sticky to do anything with. Place it back in the bowl, cover with cling film and chill in the fridge for an hour. 3. On a lightly floured surface, roll out the dough to a rectangle, about 50 x 20cm and about 1cm thick. Flatten the butter to a rectangle, about 33 x 19cm, by bashing it with a rolling pin. Lay the butter on the dough so that it covers the bottom two-thirds of it. Make sure that it is positioned neatly and comes almost to the edges. 4. Fold the exposed dough at the top down one-third of the butter. Now gently cut off the exposed bit of butter, without going through the dough, and put it on the top of the dough you have just folded down. Fold the bottom half of the dough up. You will now have a sandwich of two layers of butter and three of dough. Pinch the edges lightly to seal in the butter. Wrap the dough in cling film and put back in the fridge for an hour to harden butter. 5. Remove the dough from the wrap and place on a lightly floured surface. Roll it out to a rectangle, about 50 x 20cm. Going from a short edge, fold up one-third of the dough and then fold the other third on top. Rewrap the dough in cling film and chill for another hour. Repeat this stage twice more, putting the dough back into the fridge in between. 6. Leave the dough in the fridge overnight to rest and slightly rise. 1. In a bowl, whisk the egg yolks with the sugar for a couple of minutes until light and thick, then stir in the flour. 2. Put the milk in a pan and bring it slowly just up to the boil. Pour the milk onto the egg mixture, whisking all the time. Return it to the pan and stir over a low heat with a whisk until it comes up to a gentle boil and starts to thicken. Continue to cook, stirring all the time the whisk for about 2 minutes. 3. Remove from the heat, stir in the vanilla extract and pour into a bowl. 4. Cover with cling film and allow to cool. Make sure the cling film is fully touching the whole surface of the creme pâtissière to prevent a skin forming. Place in fridge until completely cool. 1. Line baking trays with baking paper. 2. Cut the dough (that has been chilling overnight) in half. Roll one half out on a lightly floured surface to a large rectangle, approximately 40cm x 20xm. Smear half the crème pâtissière over the dough, leaving about 3cm margin along one of the long edges. Sprinkle half the raisins and cinnamon over the crème. Starting from the long edge that does have cream roll the dough into a sausage, keeping it as tight as possible – When you reach the end, roll it back and forth a few times to seal the join. Cut into 12 slices. 3. Repeat with the second piece of dough and remaining ingredients, so that you end up with a total of 24 slices. 4. Lay cut side up on the baking trays. They will expand a fair bit during cooking, so leave a good gap between each one. Place each tray inside a clean plastic bag, or cover with cling film. Leave to rise at room temperature until at least doubled in size, about 2 hours. 5. Heat oven to 200°C/400F. Brush the pastries with beaten egg and bake for 15 – 20 minutes until golden brown. A few minutes before they are done, warm the apricot jam with a little water and then push thorough a sieve. Remove the pastries from the oven, brush with the jam and transfer to a wire rack to cool. 6. When they are cooled, mix the icing sugar with 2-4 tablespoons of water until it is runny enough to drip off a spoon, but not too watery. Drizzle over the pastries. 7. Take photos to show everyone, you deserve lots of praise after all that work! I love baked treats like these, but I don’t have enough time or patience to make them. It’s probably just as well since I shouldn’t eat much of these things. But they’re so tasty and these look like no exception! Yum, yum, Vanessa! I don’t think any of us should eat much of these things! A while ago I wouldn’t have thought I’d have had the time or patience to make these either, but having this blog has made me want to branch out and try cooking different things than I would ordinarily do – it kind of makes it more worth the time investment when I get a blog post out of it too you know? But still, two days to cook something is quite excessive and definitely only an occasional indulgence of time! I would be able to tell you’ve finished your Master’s even if you hadn’t said so, since you now have time to bake for two days! 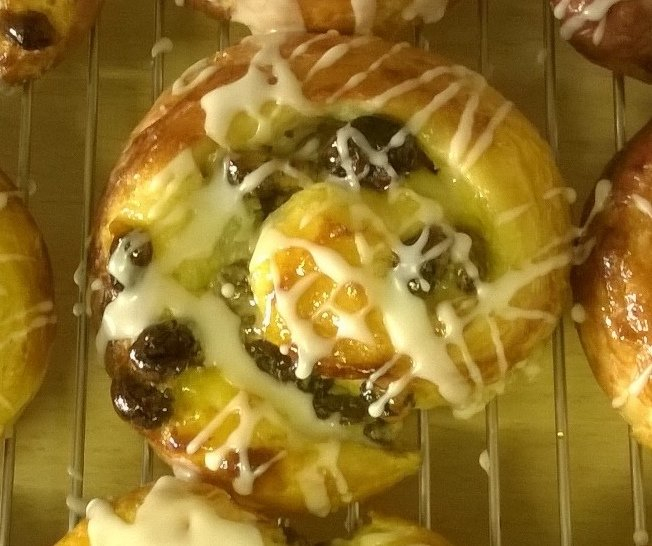 When I was little, we lived near a bakery that specialized in Danish pastry. The rolls were huge – about six inches across – and you could unroll them and eat them in small bites. So yummy! They didn’t have raisins – I honestly don’t like raisins in sweet rolls. I wouldn’t turn down one of yours, though, on that account! Umm, all that yummy pastry and chocolate, too! 😉 Neil is lucky! I love to bake things like this. I’m not much of a raisin fan, but I love dried cranberries. I think that would be a good substitute. Of course, chocolate chips are always a winner. I really enjoyed making these, but they’re far too time-consuming to do very often! Yes cranberries would be good, or I guess any other dried fruit would work too. I don’t know if your read my reply to Lorinda but I did actually make half the batch with chocolate chips, but it didn’t seem to work as well, most of them seemed to melt down and out of the bottom. That’s why I didn’t mention them in the recipe! These look so good! And now that I know how much work goes into them, I’m even more impressed by those bakers who get up in the middle of the night to make breakfast treats like these!